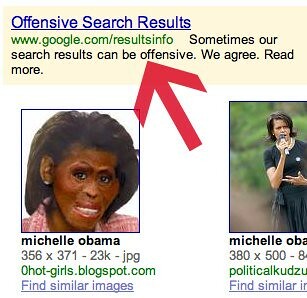 If you search on for [Michelle Obama] in Google Image Search you will see a racist and offensive image of the first lady. We first reported this image back in ten days ago and then gave Google a hard time for removing the Obama result. You find a similar message for when you search on [jew], which leads to google.com/explanation.html. I am not sure how I feel about either. On the one hand, I hate to see this type of stuff in Google's results. On the other hand, I'd hate to see Google remove results based on a manual review and on their own ethical beliefs.